Free-breathing scans are often desirable in patients who find breath-holding difficult. We present a new approach for free-breathing myocardial strain imaging with displacement-encoding (DENSE) . It acquires images with a single-shot sequence and removes respiratory motion using deformable registration. All volunteers (n = 4) were scanned on a 1.5 T Siemens Avanto scanner. A multi-slice, single-shot DENSE sequence (Fig. 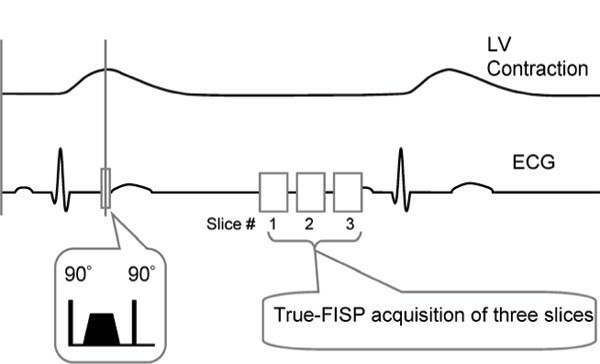 1) with true-FISP readout (Fig. 2) [2, 3] and FOV-selective excitation  was used to acquire 3 short-axis slices in a heartbeat. Ramped flip-angles through the readout train equalized the echo amplitudes. Displacement-encoding and image acquisition were placed at end-systole and late-diastole respectively, in order to capture the accumulated wall strain of systolic contraction. Imaging parameters were true-FISP echo spacing of 2.5 ms, matrix size of 128 × 40, FOV of 512 × 120 mm with restricted excitation (equivalent to a matrix of 128 × 96 with 3/4 phase-encode FOV), slice thickness of 6–8 mm, and ECG triggering every 2 RR intervals. A data set contained 270 images of 3(slices) × 3(encoding directions) × 30(repetitions). The encoding directions were oblique and combined in-plane encoding moments of 4.0 mm/radian with a through-slice (Z) moment of 1.0 mm/radian. This Z moment was sufficient to suppress the unwanted DC and conjugate-echo signal in the single-shot sequence [4, 5]. Each direction was acquired in a separate heartbeat. The total scan time was 3 – 4 minutes. Time line of left ventricle contraction, ECG and the sequence. Image registration used a deformable algorithm . The registered images produced 90 strain maps = 3(slices) × 30(repetitions). These were averaged over the repetitions to produce average strain maps for the slices. A correlation threshold was used to remove occasional images of poor registration quality due to ECG mistrigger. To evaluate strain noise reduction by this approach, we calculated the spatial variance of the pixel-wise strain values in the LV wall for three processing configurations: 1. single repetitions without averaging; 2. the average strain maps; 3. average strain map of respiratory gated (RG) data by selecting 1/3 of the repetitions with the highest diaphragm positions (end expiration). A typical circumferential strain map from a single repetition and the corresponding average strain map of all repetitions show marked difference in the noise level (Fig. 3). The spatial variance of strain decreased from 0.127 to 0.063 from single repetition to the average of the RG group, and further down to 0.054 upon registration and averaging of all repetitions. The remaining variance may account for real variation around the LV. Left: Strain map from a single measurement; Right: strain map from the average of all registered images. Deformable registration of single-shot DENSE images permits averaging over all of the respiratory cycle for noise reduction. Although the resolution of 4.0 mm is low, the pixel-wise measurement obviates the need for ROI analysis.